Are you looking for a great dental plan? PGE may be able to help you with that! 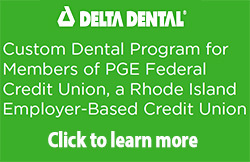 PGE Federal Credit Union is pleased partner with Delta Dental of RI to offer Members of the Credit Union an opportunity to get dental insurance coverage through Delta Dental RI at an affordable price. For Federal Employees, this is in addition to the OPM approved companies. Delta Dental has done extensive research and has found this to be one of the best Dental plans available to Federal Employees. If you are a new hire, you have 30 days from the date of hire to sign up for Delta Dental. Your monthly premium payment must come through your PGE Credit Union account. Remember, the Delta Dental Plan is not the same plan approved by OPM. For you convenience, the enrollment form and information about the plan are available on our web site.